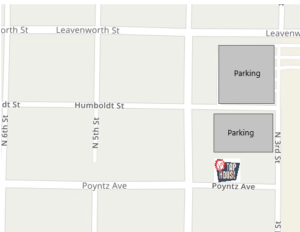 Free public parking is located on Poyntz Ave and a large public parking lot located directly to the north of Tallgrass Tap House with an entrance adjacent to the parking lot. We are located in the historic, revitalized downtown district of Manhattan, Kansas, near Manhattan Town Center. Cross streets are Poyntz Avenue and 4th Street. From Topeka/Kansas City: Take I-70 W to Exit 313/KS-177 N. Exit and merge onto KS-177 N. Continue for 8.5 miles. As you come into town, continue across the bridge. KS-177 becomes Pierre Street. Continue to intersection of Pierre Street and 4th Street. Turn right onto 4th Street. Continue two blocks north to Poyntz Avenue. Turn right onto Poyntz Avenue. The restaurant is on the north side of the street. Street parking is available. From Junction City/Western Kansas: Take I-70 E to Exit 303/ KS-18 E. Exit and at top of exit ramp, turn north (left) toward Ogden/Manhattan. Continue 13 miles on KS-18 E, which turns into Ft. Riley Boulevard as you come into town. Turn north (left) on Juliette Avenue. Turn east (right) on Poyntz Avenue and continue 0.4 miles. The restaurant is on the north side of the street. Street parking is available. From Wichita Airport: Get on US-400 E/US-54 E from S Mid Continent Rd. Take I-235 N, I-135 N, US-50 E, US-77 N and KS-18 E to S Juliette Ave in Manhattan. Continue on S Juliette Ave. Turn east (right) on Poyntz Avenue and continue 0.4 miles. The restaurant is on the north side of the street. Street parking is available. From Manhattan Airport: Get on KS-18 in Ogden from Skyway Dr. Exit and at top of exit ramp, turn north (left) toward Ogden/Manhattan. Continue 13 miles on KS-18 E, which turns into Ft. Riley Boulevard as you come into town. Turn north (left) on Juliette Avenue. Turn east (right) on Poyntz Avenue and continue 0.4 miles. The restaurant is on the north side of the street. Street parking is available. Restaurant and Menu Description – Located inside an 11,000-square-foot brewpub, Tallgrass Tap House offers guests a fun and lively atmosphere, while serving an American-Gastropub style menu. The menu features a wonderful array of options, from locally sourced beef, to fresh seafood, and even Korean inspired dishes. There is something to satisfy everyone! Hours of Operation – The dining room is open 11:00am – 11:00pm, Monday through Thursday; 11:00am – Midnight, Friday and Saturday; and 11:00am – 10:00pm on Sunday. The kitchen closes at 10:00pm every night. Happy Hour – Monday through Friday, 3:00pm – 6:00pm, and All-Day Sunday Tap House Exclusives are $3.00. Reservations – Reservations are accepted, but not required. A portion of the restaurant is available for walk-in guests. Our bar is open seating, as is our Roof Top Patio, when in season. The Tap House accepts limited reservations for parties of 6 guests or larger. Reservations can be made online or by calling the restaurant at 785.320.2933. Walk-ins Welcome – Yes, please do visit us without a reservation! Normally we are able to accommodate diners without a wait, unless it is a very busy night or special event. If there is a wait, then we will take your name, communicate a time frame, and you are welcome to relax and enjoy a drink until your table is ready. Gift Cards – Give the gift of a Tallgrass Tap House experience! Stop in to purchase a gift card at our bar or call the restaurant during business hours. Gift cards are valid for 5 years from date of purchase. Private Dining – Tallgrass Tap House offers private dining spaces with unique venues that can accommodate the needs of many different occasions. Please call the restaurant to speak to our Event Coordinator for more details at 785.320.2933.